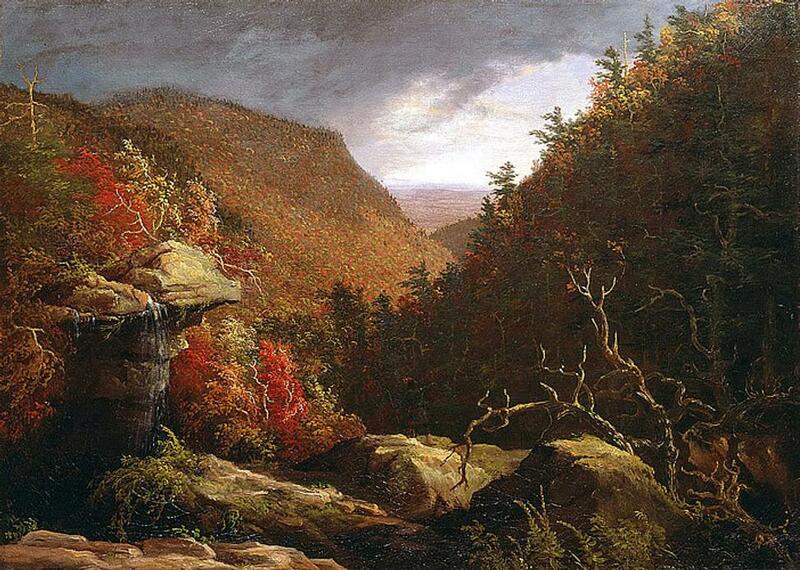 Thomas Cole, The Clove, Catskills, Oil on canvas, 1827, 25 ¼ x 35 1/8 in. New Britain Museum of American Art. Charles F. Smith Fund, 1945.22. Landscape art in the early 19th century was guided by two rival concepts: the picturesque, which emphasized touristic pleasures and visual delight, and the sublime, an aesthetic category rooted in notions of fear and danger. British artists including J.M.W. Turner and John Constable raised landscape painting to new heights and their work reached global audiences through the circulation of engravings. Thomas Cole, born in England, emigrated to the United States in 1818, and first absorbed the picturesque and sublime through print media. Cole transformed British and continental European traditions to create a distinctive American form of landscape painting. This exhibition, from May 1 to Nov. 4, 2018, is designed to complement the major Cole exhibition at The Met and is curated by Tim Barringer, Paul Mellon Professor in the History of Art at Yale; Gillian Forrester, Senior Curator of European Art at the Whitworth Art Gallery, University of Manchester (and previously at the Yale Center for British Art); Jennifer Raab, Associate Professor of the History of Art at Yale; and two doctoral candidates at Yale, Sophie Lynford and Nicholas Robbins. Picturesque and Sublime will present masterworks on paper by major British artists, including Turner and Constable, together with significant oil-on-canvas paintings by Thomas Cole to demonstrate Cole’s radical achievement of transforming the well-developed British traditions of landscape representations into a new bold formulation, the American Sublime. 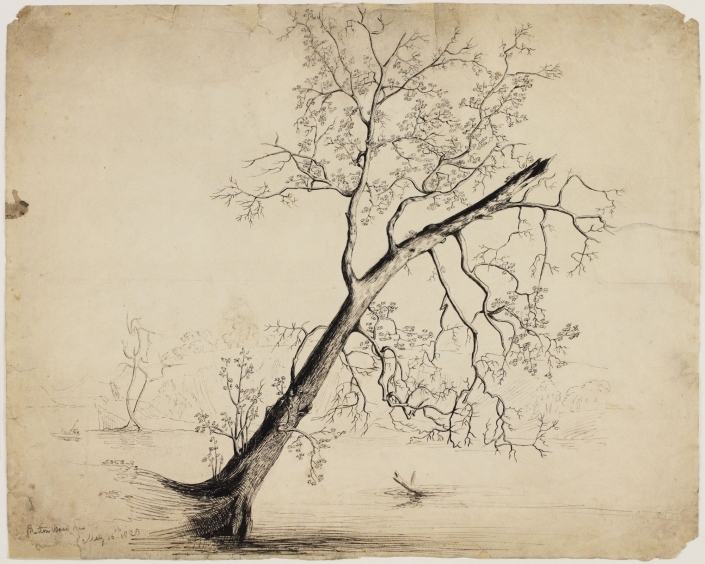 Thomas Cole, Button Wood Tree, Ink on paper, 13 1/2″ x 16 7/8″, The Albany Institute of History & Art, Gift of Mrs. Florence Cole Vincent, 1958.28.36. The authors here explore the role of prints as agents of artistic transmission and look closely at how Cole’s own creative process was driven by works on paper such as drawings, notebooks, letters, and manuscripts. Also considered is the importance of the parallel works of William Guy Wall, best known for his pioneering Hudson River Portfolio. Beautifully illustrated with works on paper ranging from watercolors to etchings, mezzotints, aquatints, engravings, and lithographs, as well as notable paintings, this book offers important insights into Cole’s formulation of a profound new category in art—the American sublime. Tim Barringer is Paul Mellon Professor in the History of Art at Yale University. Gillian Forrester is senior curator of historic fine art at the Whitworth Art Gallery, Manchester. Jennifer Raab is assistant professor in the history of art at Yale University. Sophie Lynford and Nicholas Robbins are doctoral candidates in the history of art at Yale University.